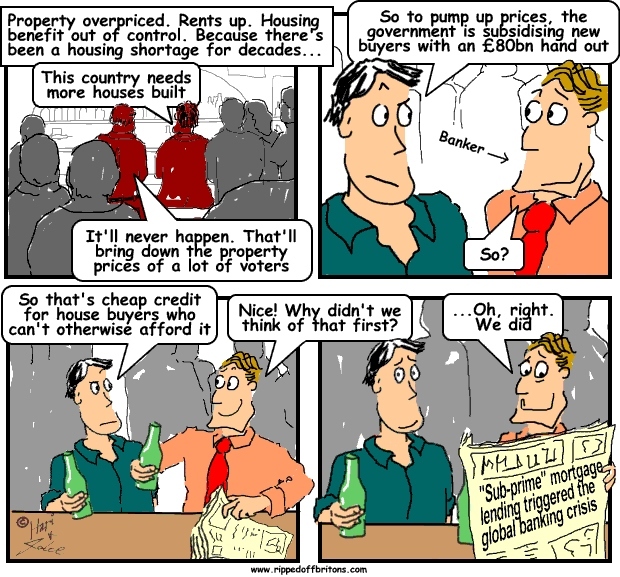 £80bn for Help to Buy 'bubble' could push house prices up by 30%... How about building some houses! The Government’s "reckless" Help to Buy scheme uses taxpayer money to provide a loan of up to 20% of the value of a new build property, provided the borrower can raise a 5% deposit. But it risks creating a new housing bubble and could push the average UK house price up by 30% to £300,000 by the end of 2015, a leading economic think-tank has warned. “Help to Buy is a reckless scheme that uses public money to incentivise the banks to lend precisely to those individuals who, absent the scheme, would not and should not be offered credit," said Fathom Consulting, set up by former Bank of England economists.